Buttery and sweet with a giggle of sparkly orange flavor, covered in a sticky-sweet glaze that melts in your mouth – these are the sweet rolls that dreams are made of. 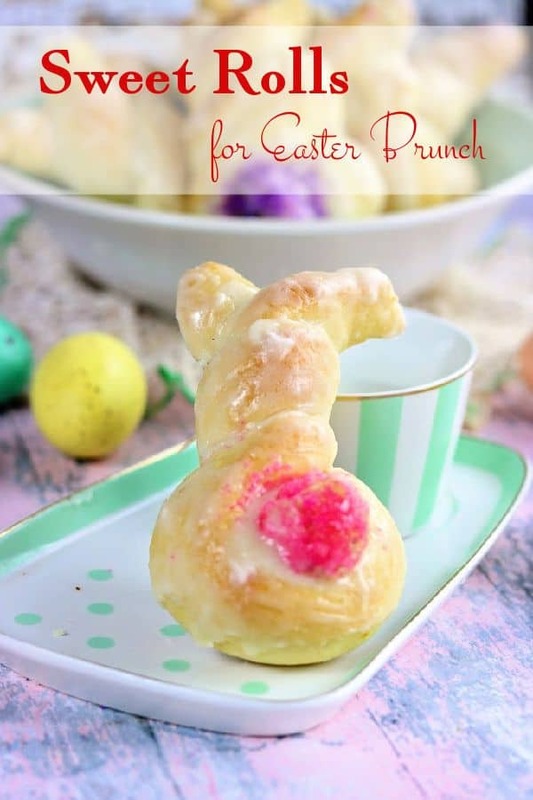 Make them in a cute, bunny shape for Easter Brunch. Hello, Spring! These are a fun alternative to the traditional Hot Cross Buns on so many Easter tables. For many of us Easter is the first holiday of Spring and filled with memories of shiny new patent leather shoes, white gloves, and crispy brand new dresses. Perhaps a small, lacy purse and a hat with an elastic that made you feel like you were choking, as well. The day was predictable. Pictures, followed by church, followed by an Easter egg hunt with boiled eggs – so God help you if you missed one. You’d be sure to find it a month or so later! Easter baskets and Easter brunch at a table laden things like sweet rolls, pineapple casseroles, and always with a ham that smelled so good it made the neighbors drool. I can’t tell you how many times I got blistered fingers from the sticky, hot glaze as I tried to sneak a miniscule bite of sugary crust from the outside of that dang ham. It seemed like most things were sweet, most things were fancy, and most things were memorable enough to make me smile half a century later. This Easter recipe is from a 1959 vintage holiday cookbook put out by Better Homes and Gardens. This could be a picture from my childhood for sure! Look at that picture! LOL! It’s an image I snapped out of the original cookbook. You gotta love those Mrs Cleaver type moms that went the extra mile to make holidays special! These are really not difficult. 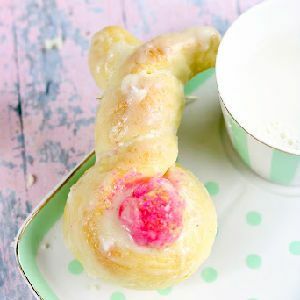 I tried to make the sideways bunny sweet rolls but I didn’t like how they came out – I’ve included instructions for both but my images only show the backwards bunny. I made my bunnies with pink and purple tails… because why not? Can you freeze orange rolls? You sure can! You can shape them and freeze them before the second rising time – then just thaw overnight in the fridge and bake. OR you can freeze them after baking – but don’t glaze them until you’re ready to serve. To serve them you’ll thaw overnight, then heat in a 325F oven for 10 minutes or so – and then glaze as directed. Can you refrigerate dough after it rises? You can also make these orange sweet rolls the night before, shape them, and cover with plastic wrap. Put them in the fridge overnight and then bake them in the morning. They will have risen while you slept! Sometimes you need to give them 15 – 30 minutes on the counter to finish rising before baking if they don’t look risen. Silicone baking sheets make all the difference in how baked goods come out! No more sticking or too-brown bottoms. I love to serve sweet rolls, warm from the oven with the glaze still gooey, at just about any brunch but even more so on holidays like Christmas and Easter. Here are some of my favorites. And then there’s this Raspberry Danish tempting me from Simply Home Cooked! There’s not a kiddo in the universe that wouldn’t just love to wake up to the smell of these homemade orange buns wafting through the house on Easter morning! These Easter Egg Nest No Bake Cookies would be a cute addition as well! 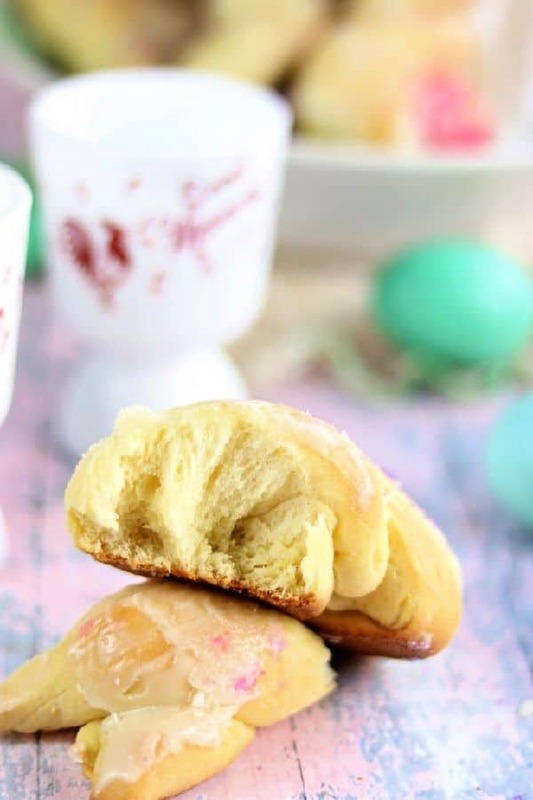 This light, buttery sweet roll with a delicate orange flavor and a sweet, sugary glaze is everything you want on your Easter brunch table. Blend milk, butter, sugar, and salt. Make sure that the mixture is lukewarm. Stir in 2 cups of the flour. Stir in yeast, orange juice, and peel. Add enough of the remaining flour to make a dough. Knead dough 10 minutes, or until elastic, on a floured surface. Place in a greased bowl, turn to grease top, cover and allow to rise until double. About 2 hours. Punch down, cover, and allow to rest 10 minutes. On a lightly floured surface roll dough into a 1/2 inch thick rectangle. Cut dough in strips about 1/2 inch wide and roll between hands to smooth.You can make these into two kinds of bunnies. For each bunny you will need a 14 inch strip of dough. On a lightly greased cookie sheet lap one end of the strip over the other to form a loop. Now, bring the end that is underneath up over the top end, letting each end extend to the sides to form ears. Pat tips of ears to make a point. Roll a small ball of dough and put it on the bottom loop for a tail. For each bunny you will need a 10 inch piece of dough for the body and a 5 inch strip for the head. On a lightly greased cookie sheet make a loose swirl for the body with the longer strip, and one for the head with the smaller strip. Place the head close to the body. To add the ears pinch off 1 1/2 inch strips of dough and roll to form ears. Place next to the head. Use a little bit of dough to make a small ball for the tail. Allow to double.The second rise will take from 45-60 minutes. Bake at 375 for 12 -15 minutes. Frost while warm with sugar glaze. Brush over rolls while they are still hot. Thank You. 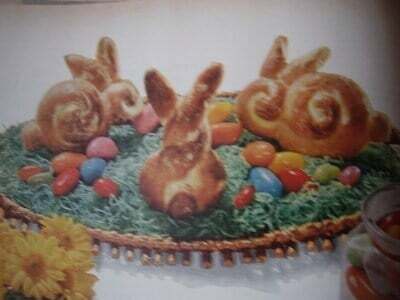 I lost my old Better homes cook book,I found a newer edition but it did nor have this recipe.I’ve made these for over 35 years at Easter and my grown children still look foreward to these bunny breads every year.